One the the most versatile, money saving products found in the average household kitchen is a packet of baking soda or bicarbonate of soda. It has been widely used since the 1800's and has many other names such as baking powder, bread soda, cooking soda, sodium bicarb, bicarb soda or simply just bicarb. All of these are just different names for the same thing and over the years many generations have come to appreciate and trust the many uses of baking soda. In fact you can almost always bank on there being a baking soda use for most household chores. The many and varied uses for baking soda range from cleaning kitchen and household items through to deodorising major appliances and washing clothes and toys. 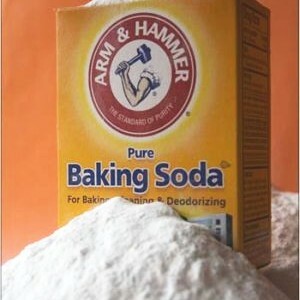 Baking soda can even be used to help keep your skin and teeth clean or as an effective skin acne treatment. If you suffer from acne or have acne scars you should look at a Natural Way of Treating Acne that actually targets the cause rather than just treating the symptoms with expensive products. There are just so many ways to use bicarb soda in your home and one of the best attributes of baking soda is that it is a natural cleaner and very environmentally friendly. this means that you can use it with the knowledge that you aren't contributing to filling the planet with unnecessary chemicals. Also because it is such a safe product you have the added insurance that you cannot go wrong with the amounts and proportions that you use. We hope that you appreciate and are able to use some of the Free baking soda uses that are available on this website. If you would like to share your own tips or experiences on baking soda uses then you can do so by clicking here.